We like to say you haven’t seen Wichita if you haven’t seen the Keeper of the Plains, especially during its nighttime firepot lighting. We might have to amend that statement to: you haven’t experienced Wichita if you haven’t camped in the shadow of the Keeper of the Plains. 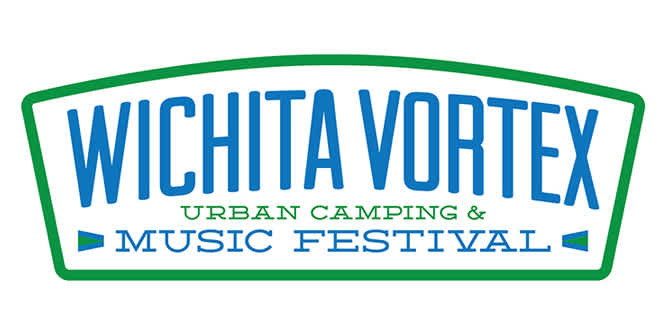 Wichita Festivals, Inc., which puts on Riverfest, the largest and longest-running festival in Kansas – is launching the Vortex Music Festival on Aug. 4 and 5. Named for Allen Ginsberg’s 1966 poem, “Wichita Vortex Sutra,” the festival will offer a Friday evening lineup of Americana, alt-country, classic bluegrass and thrash grass and the rare urban camping opportunity near Wichita’s most iconic landmark. The 44-foot, five-ton Keeper of the Plains steel sculpture of a Native American chief pays tribute to the Native Americans who made the area their home before the arrival of European settlers. Kiowa artist Blackbear Bosin (1921-1980) created the statue and presented it to the city in 1974. In 2007, the Keeper was restored and reinstalled on a higher platform to elevate the statue an additional 30 feet. It is located at the confluence of the Arkansas and Little Arkansas Rivers and is surrounded by Keeper of the Plains Plaza, which features exhibits depicting the Plains Indians’ way of life and representing the four elements essential to life – earth, air, water and fire. The Keeper is majestic in any light but you need to experience the 15-minute “Ring of Fire” at 9 p.m. (spring and summer) or 7 p.m. (fall and winter), weather permitting. Access to the plaza area is by two bow-and-arrow-inspired cable-stay bridges or through the Mid-America All-Indian Center during the day. The entire area is wheelchair accessible. The Mid-America All-Indian Center houses a museum, gallery of nations and a gift shop featuring artists’ work. They also host programs showcasing the heritage of the Native American. Vortex Music Festival will take place on and adjacent to the grounds of the Mid-America All-Indian Center. Music begins at 4 p.m., Friday, Aug. 4, on two stages. On the main stage are: Carrie Nation & the Speakeasy, Moreland & Arbuckle, Lindi Ortega, Pokey Lafarge, followed by headliner Dwight Yoakam’s bluegrass and country performance. Scheduled on the campground stage: Julian Davis & the Hay-Burners, Fast Food Junkies, Bailey Kate & the Running Late and Urban Pioneers, followed by open mic starting at 9 p.m. Admission to the festival includes activities and access to purchase food trucks and vendors selling local craft beer and tasty food. There will be water balloon fights, watermelon-eating contests, hula-hooping and lawn games as well as late-night activities like glow-in-the-dark horseshoes and a movie screening under the stars in the festival area when the music ends, about midnight. Tickets are on sale now at WichitaVortexFest.com. Standard Issue Festival Passes are $65 (until sold out or July 27). Starting July 28, any remaining regular festival tickets will be sold as the $85 Procrastinators Pass. For those who want premium seating and bar access, up to 400 Vortex VIP Passes will be sold for $100. Campers will need a $50 Happy Camper Overnight pass in addition to their festival pass. The camper pass includes a tent campsite or RV parking (overnight security provided) for up to four people and tickets to the all-you-can-eat Pancake Pack-Up Party from 9 to 11 a.m. on Saturday morning. Tickets for just the pancake breakfast and morning entertainment – regional favorite Cherokee Maidens – are $15. Click here for more information on this year’s Vortex Music Festival.